Have you ever wondered about the probability or random nature of online pokies? How the video reel determines the spin results, or how a bonus round is initiated, or how the are results produced? In essence, every pokies machine, live or on the Web, has a Random Number Generator behind-the-scenes that determines the randomness of Web slots. Both live brick and mortar casino establishments and Internet casinos need to artificially replicate the random nature of outcomes that happen in every casino game from slots to roulette. To do this requires computational methods. In comparison to the physical method Random Number Generation, which is represented by manual production of unbiased results – the spin of a roulette wheel, for example – computer simulated software RNGs digitally run algorithms to produce random, unbiased results. In pokie machines in brick-and-mortar casinos and Web pokies games, computational RNGs are the type used. Inside physical slot machines, a computer chip runs the RNG every time a player presses spin, by using random numbers in the range between 0 and several million. Every time a machine is played, it takes a seed from the RNG and uses a highly complicated algorithm computer program which determines the final values the reels show. To simulate randomness in online pokies, computer RNGs use complex and hidden formulas to produce sequences of numbers. 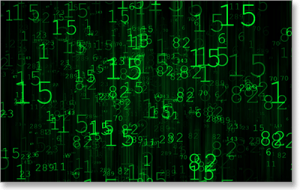 Each sequence of numbers begins with another number referred to as the seed; this is also randomised. These numbers produce unpredictable outcomes which lack any identifiable pattern that can exploited or be seen as unfair. Contrary to what many players may think, RNGs aren’t subject to previous outcomes. They don’t generate subsequent results based on previous ones; this ensures probability remains the same as it does for the similar RNGs which govern physical slot machines at live casinos. Some distinction needs to be made in regards to true RNG software and what is known as psuedo RNG systems. True RNG: Also referred to as ‘genuine’ RNG, these systems maintain randomness and unbias results with the constant production and programming of unique algorithms. These sorts of highly complex and involved systems are used in fields such as quantum physics. Psuedo RNG: A similar system which relies on algorithms to produce lengthy groups of numbers connected by a starting value, known as a ‘seed’. It’s referred to as ‘psuedo’ because the mathematical formula used to determine each outcome is the same. Despite their differences, both types of RNG systems maintain a consistent level of unbias results and unpredictability. As such, psuedo-RNG are adopted in the majority of online casinos. This is because true RNG systems are extremely expensive and usually only in use or intended for use in the fields of science or research. For a Web operator to maintain each system for their huge catalogue of games would mean a substantial fee. How are pokies RNGs verified? It’s understandable for players to wonder if the word of an Internet casino operator is enough to guarantee fairness in the RNGs running their online pokies games. Any well informed and responsible player will always want additional answers before spending their real money. 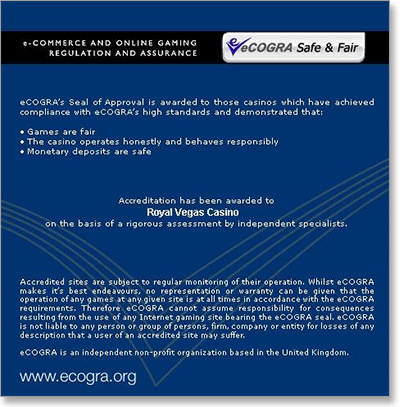 To give their players peace of mind, the best and most legitimate sites seek out regular independent testing from reputable gambling industry watchdogs, such as eCOGRA (eCommerce and Online Gaming Regulation and Assurance) and to display certified approval that their RNG systems are truly random and unpredictable – and not in any way exploitable, exploited, or tampered with ever. eCOGRA services all online gaming software providers and operators on a monthly schedule for payouts and bi-annual basis for RNG systems. They analyse the casino’s payout and RNG data based on live gaming results and provide their figures and verdict on their website and for the casino to display on theirs. On the homepage of all of our recommended casinos, eCOGRA’s seal of approval, as well as statistical reports on the site’s payouts and RNG systems are provided openly, so cautious players can rest easy when playing their favourite real money online slots games. Looking for the most fair and reputable real money AUD online casinos to play RNG pokies? Our top recommended site with official eCOGRA approval and widespread recognition for fairness is www.RoyalVegasCasino.com.